I own a 16 GB smartphone and I don't have plans yet in upgrading it. I am saving up for our vacation to the Philippines this July so I am reserving the idea of buying a new phone for next year. I love my phone and I love taking pictures with it, I don't think I'll ever need to buy a DSLR camera (maybe in the future) but yeah I only want a compact camera with a DSLR capabilities. I had a DSLR camera before but it was too bulky and I can't stand taking it to events I attend every time. I take lots of photos, I guess we all do, (it's quite addictive right) so my phone storage gets full very quickly. A big chunk of my phone storage goes to the images and it always happen that I ran out of storage while out and about so I have no option but to delete some of the photos which I haven't downloaded yet to my computer and that's kind of frustrating most of the time. I've only been to the airplane's passenger cabin few many times but never in the cockpit. Although I've seen it in movies and in many occasions on TV, I am always curious about (and probably you are as well) how it feels like to sit with the pilot flying the plane or how it feels like to be a pilot yourself and fly a commercial aircraft. My curiosity was put to rest and my dream of seeing an airplane's cockpit in real life came true when iPilot, a world leader in flight simulator experience with locations in London, Munich, Berlin, Dresden, Hamburg, Dusseldorf, Prague, Dubai, Basel, and Zurich, invited us to experience and fulfilled our dream of flying an airplane - a Boeing 737. It wasn't the real one though, but the one that aeronautics students used to train and prepare for their exams with. It gives you the same flight experience, only this time you are the captain. iPilot is located at the 2nd level of Dubai Mall opposite Sega Republic. It is a small shop with deep red and white interiors. The first part of the store is the reception, merchandise display and a flight simulator machine used by trained pilots. The second part is the closed cockpit with two rows of passenger seats behind it where we had our first flight simulator experience. We were booked for a two hour simulator experience for four people. The cockpit was free when we arrived so we get to start immediately. 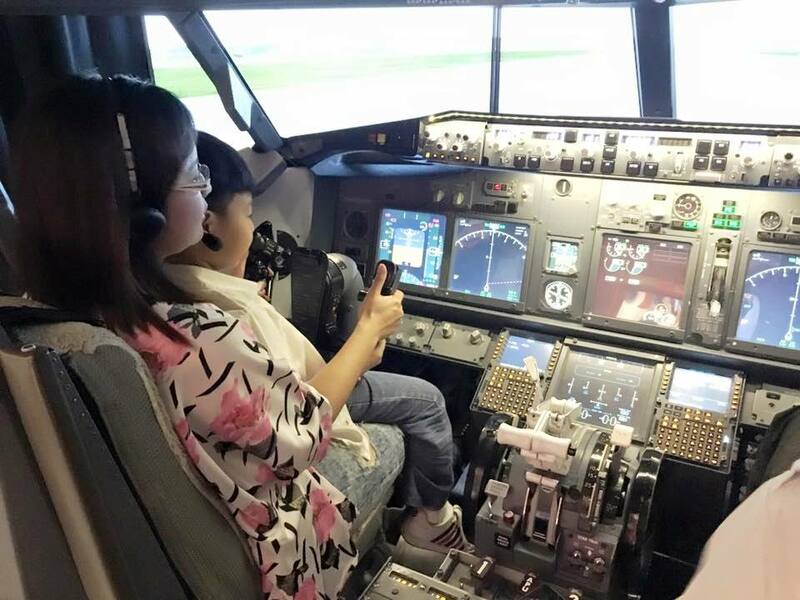 Prince flew and landed the plane to Dubai, he was still too small to see the view from the windshield above and reached the pedals below that control the plane's direction while on the ground but nonetheless, he was happy to touch the control wheel, throttle and flap. When it was Ferald's turn, I requested Jeetu to give him a challenging flying experience. So he added some turbulence, rain and thunderstorm. Ferald hates flying because he get nauseous and I told him to please try not to throw up this time (pun intended of course). We laughed and he said that this is completely different because this time he is in the front seat and he wouldn't feel as much movement compared when he is sitting in the economy seat behind. Jeetu gave Ferald a rundown of all the controls and they took off from Dubai and landed in Hong Kong Kai Tak airport, the one that's between the city and the mountains. Ferald said it was very challenging and the plane wasn't easy to maneuver but he was so thrilled of the experience. I on the other hand took off from where Ferald landed and landed at St. Maarten airport, few meters away from Maho Beach. Hong Kong and St. Maarten airports are two of the most favorites among the 24,000 airports in the iPilot system. 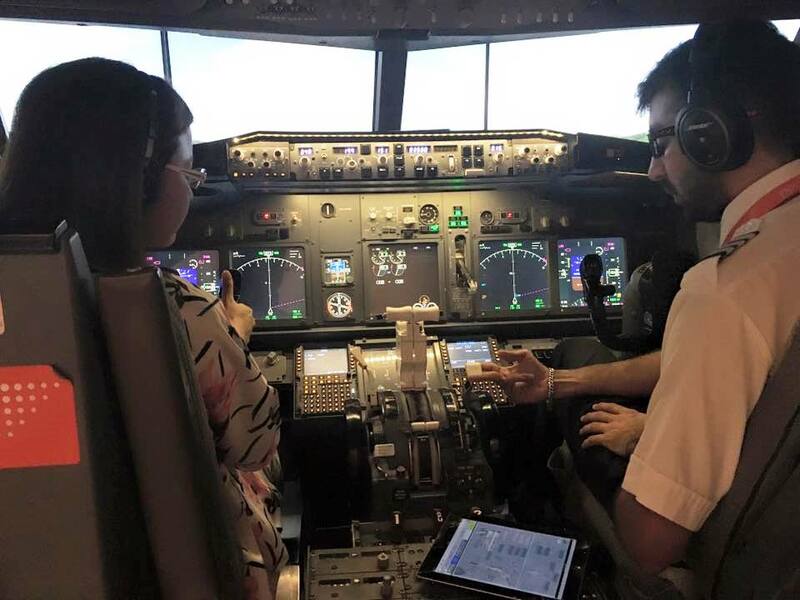 Before my flight, Jeetu explained to me the use of all the levers (throttle, flap, landing gear) buttons (autopilot control), pedal and switches in front of us and I listened carefully (note: each of us got a one on one training and I must say he must be a very patient man). I tried to comprehend as much as I could but for a first timer like me, it was not easy to remember all the uses of each switches and what's on the screens all at once. Am I nervous? Very much! I am scared that I will not to be able to manipulate the aircraft quite right but Jeetu would show me how and fly the plane with me. We landed safely at St. Maarten airport and I didn't crash the plane, thank goodness and thanks again that I have a co-pilot that knows what he is doing. This is just a flying simulator and yet everything seems so real. 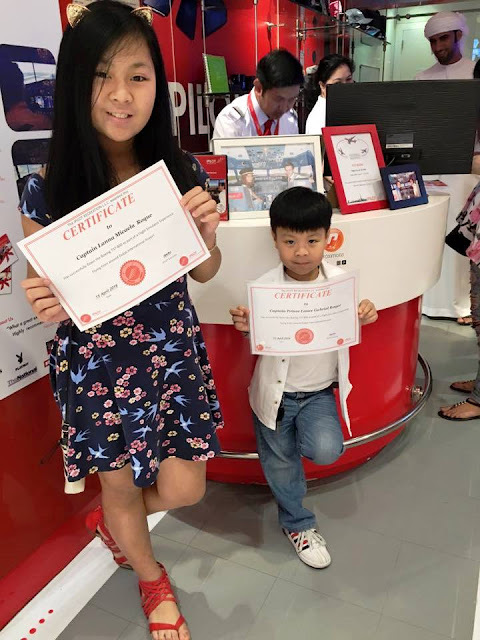 It was a total immersion experience for my family and an experience we will never forget and just maybe, can be used by my kids in the future. I had a short conversation with the iPilot store manager and he mentioned iPilot was looking to introduce the service to schools here in Dubai which I honestly think is a good thing to do. Students in higher levels can have the chance to try the flight simulator and who knows it could give them an idea of what they'd like to do in the future. iPilot Flight Simulator Experiences starts at 349 AED for 15-minute flight. Packages and Gift cards are available at iPilot eshop. 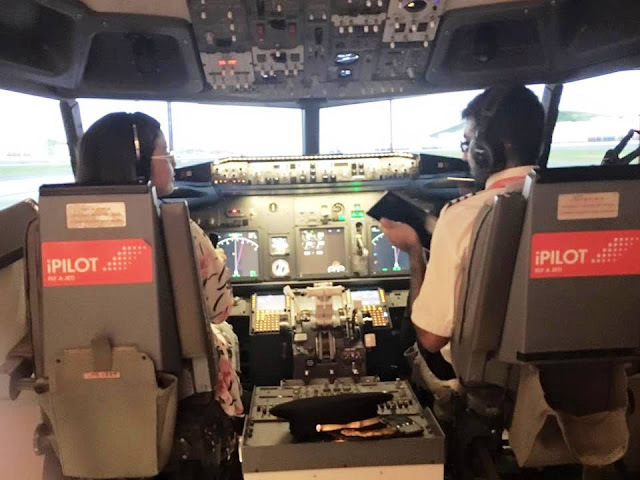 We were invited to experience iPilot Flight Simulator but all opinions and photos in this blog post are my own. Centro Sharjah is a modern and stylish yet affordable business hotel in Sharjah. 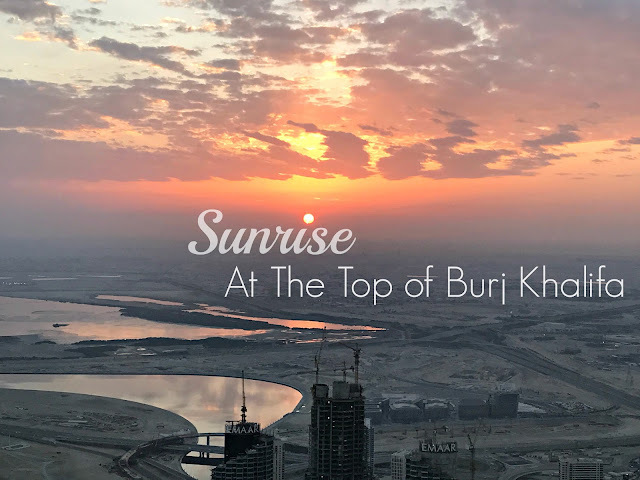 Located adjacent to Sharjah International Airport and just 15 minutes away from Sharjah business district, it is a great hotel choice for Sharjah bound business travelers and tourists. But Centro, despite being a business hotel is also a favorite among locals and residents who wants to have some well deserve R and R. Those who wanted to get away from the hustle and bustle of the city without having to travel far can rest and relax at this hotel. Although close to the airport, you wouldn't feel it at all as it is secluded by tall trees and lush greenery, has a big pool, beautiful rooms and the all day dining restaurant serves good food. In short, it is a good place to relax for families or couples wanting to have quality time.